Summary: Every frame, every detail – the stitching on a toy – is meticulous and beautiful. 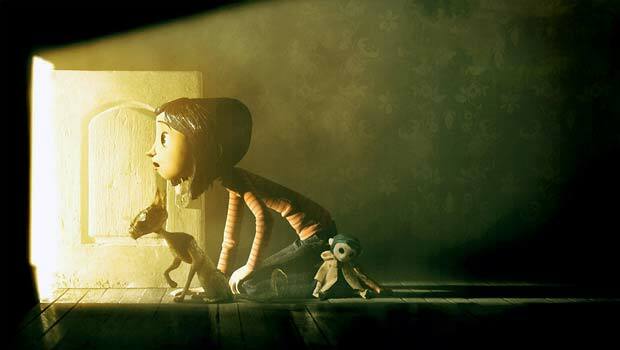 Coraline (aka “Coraline & the Secret Door”) is a bloody scary film for children and for that reason alone I advise you to take your kids to see it. As you may or may not know I am a long time fan of the Blessed Neil Gaiman and frankly I squeeed with excitement when I found out about the Coraline project; I was even more delighted to find out that it would be stop motion animation and in fact I was pretty much delighted by everything about it including the awesome alphabet posters and the fact that it was in 3D. So I kind of expected to be disappointed by the final product. But first: Coraline – not Caroline – Jones (Fanning) and her parents have just moved to a new apartment but, with a magazine to put to bed, Mr (Hodgman) and Mrs Jones (Hatcher) barely have time to unpack let alone entertain their daughter. Left to her own devices, and missing her friends, Coraline’s imagination is captured by the strange little door in the house. Unfortunately, its locked, so Coraline is forced into the company of Wybe (Bailey Jr), an irritating local boy close to her age, and also meets the eccentric neighbours: retired actresses Miss Spink and Forcible (Saunders and French), as well as mouse circus owner Mr Bobinsky (McShane). Coraline is, to my mind, the most perfect marriage between Neil Gaiman’s storytelling and the moving image thus far, and the consummate artistry of the production team has much to do with it. Every frame, every detail – the stitching on a toy – is meticulous and beautiful and combines so cleverly with the 3D technology that 3D, far from being an irritant, is here a delight. It is, as I said, also genuinely scary; Coraline isn’t in mild peril, she is under siege, and she gets out of it through her own courage and ingenuity and despite her fear, just as she does in the book. And hurrah for that. My only quibble actually relates to this point. Wybe, who is a new introduction, is initially quite feeble and acceptable, but his part in the denoument is annoying – in the book Coraline manages alone and it takes something away from her that her she is shown as needing help. And that is the only reason why the film gets 9 instead of 10, for in every other way it is perfect! And you should go and see it, if only to remind yourself that entertainment for children can be challenging, and beautiful, and brutal, and hard to watch sometimes. And should be so, lest we raise a generation of kids on the cinematic equivalent of those padded playgrounds.